At Florida Orthopaedic Institute, we make it very convenient to have your diagnostic work done here rather than having to travel to a different facility. We offer early, late and Saturday hours for MRI testing. Our scheduling department makes every attempt to be flexible with appointment times and can be reached at 813-978-9700, extension 7991 or you can schedule an appointment online. Magnetic Resonance Imaging, or MRI, is an imaging test allowing physicians to visualize internal structures of the body for disease or abnormal conditions. MRI does not use radiation for imaging, like an x-ray or computed tomography (CT) scan. Instead, MRI examinations use specialized equipment with a powerful, constant magnetic field, rapidly changing local magnetic fields, radiofrequency energy, and dedicated equipment including a powerful computer to create clear pictures of internal body structures. Often an MRI gives different information about structures in the body than are seen with an X-ray, ultrasound, or CT scan. MRI examinations are performed in a special room that houses the MRI scanner. Patients lie down on a comfortably padded table that gently glides the patient into the scanner. Most MRI examinations take approximately 30 minutes to complete. Once the entire MRI examination is complete, a board certified musculoskeletal radiologist reads the images and generates a report for your physician to review to help determine treatment options. For some MRI studies, a contrast agent is injected directly into the joint to better evaluate joint & soft tissue structures. This is often done first utilizing the guidance of the CT Scanner and then completed in the MRI scanner. Arthrograms can be used for multiple joints including the shoulder, elbow, wrist, hip, knee & ankle. They are used to diagnose of rotator cuff tears, adhesive capsulitis, tears of the rotator interval, disorders of the biceps tendon and impingement syndrome. Computerized tomography (CT) scanning is a noninvasive medical test that helps physicians diagnose and treat medical conditions by combining special x-ray equipment with sophisticated computers to produce multiple images or pictures of the inside of the body. Internal organs, bones, soft tissue and blood vessels have greater clarity and reveal more details with a CT scan than with a regular x-ray exam. They are also called CAT scans (computerized axial tomography). Through the use of CT scans, radiologists can diagnose problems such as cancers, cardiovascular disease, infectious disease, appendicitis, trauma and musculoskeletal disorders. With CT scanning, numerous X-ray beams and a set of electronic X-ray detectors rotate around the patient, measuring the amount of radiation being absorbed throughout the body. At the same time, the examination table is moving through the scanner, so that the X-ray beam follows a spiral path. A special computer program processes this large volume of data to create two-dimensional cross-sectional images, which are then displayed on a monitor. CT examinations are typically completed within 20 minutes. Once the CT examination is complete, a board certified musculoskeletal radiologist interprets the images and generates a report for your physician to review and help determine treatment options. An electromyogram (EMG) measures the electrical activity of muscles at rest and during contraction. Nerve conduction studies (NCS) measure how well and how fast the nerves can send electrical signals. If you have leg pain or numbness, these tests can help find out how much your nerves are being affected. They check how well your spinal cord, nerve roots, and nerves and muscles that control your legs are working. EMGs are done to find diseases that damage muscle tissue, nerves, or the junctions between nerve and muscle. These problems may include a herniated disc, amyotrophic lateral sclerosis (ALS), or myasthenia gravis (MG). EMGs can also help identify the cause of weakness, paralysis, or muscle twitching. Problems in a muscle, the nerves supplying a muscle, the spinal cord, or the area of the brain that controls a muscle can cause these symptoms. The EMG does not show brain or spinal cord diseases. EMGs are done by an EMG technologist or a doctor. Electrodes record the electrical activity in the muscle while at rest and contracted. The doctors at Florida Orthopaedic Institute who perform EMGs go to 4 years of medical school then have 3 or 4 more years of training in a residency program, plus fellowship training. This specialized training helps them decide which tests to perform based on your symptoms. Nerve conduction studies can be performed by trained technologists under a doctor’s supervision. Nerve conduction studies (NCS) are done to find damage to the peripheral nervous system, which includes all the nerves that lead away from the brain and spinal cord and the smaller nerves that branch out from those nerves. They are often used to help find nerve problems such as carpal tunnel syndrome or Guillain-Barré syndrome. In the test, electrodes record the time it takes for the muscle to contract in response to electrical pulses. The speed of the response is called the conduction velocity. The same nerves on the other side of the body may be studied for comparison. Nerve conduction studies are done before an EMG if both tests are being done. Florida Orthopaedic Institute is one of the few facilities in the country accredited by the American Association of Neuromuscular & Electrodiagnostic Medicine (AANEM). The AANEM is the only EMG accrediting association in the country and recognizes facilities for achieving and maintaining the highest level of quality, performance, and integrity based on professional standards, and is structured to assess, evaluate, and improve patient care. It is the recognized standard for EDX medicine. Fluoroscopy is a study of moving body structures – similar to an x-ray “movie.” A continuous x-ray beam is passed through the body part being examined. The beam is transmitted to a TV-like monitor so that the body part and its motion can be seen in detail. As an imaging tool fluoroscopy enables physicians to look at many body systems, including the skeletal, digestive, urinary, respiratory, and reproductive systems. Fluoroscopy also allows physicians to check anatomical structures in perfect alignment as well. Florida Orthopaedic Institute offers fluoroscopy for physicians that prefer to do arthrograms, aspirations and injections in the office. Traditional X-rays have been around since the early 1900s, using film to capture images of the body’s internal structures. Today’s digital X-ray technology is widely used because of its low cost. It quickly produces the images needed, is noninvasive, and relatively harmless. Even though traditional X-rays are considered safe, digital X-rays produce 80% less radiation than traditional X-rays. Since digital X-rays don’t rely on film, there is a significant cost saving. Film is difficult to store and images degrade over time. Digital images can be saved, transferred and easily accessed without any image degradation. The image quality of digital X-ray is excellent. Images can be resized to enlarge hard-to-see potential issues without distorting or degrading the quality. 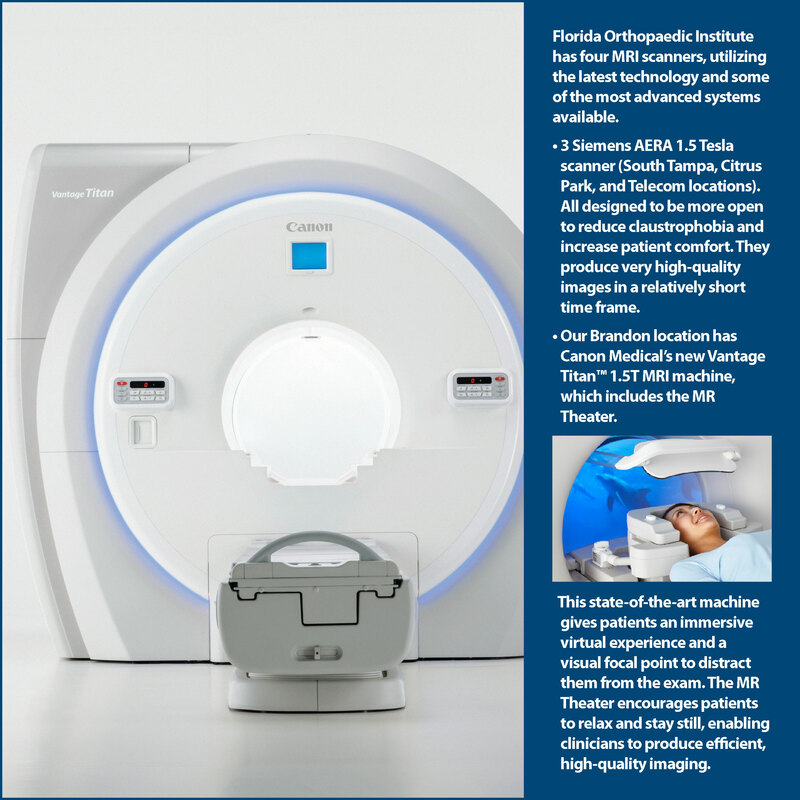 Florida Orthopaedic Institute has advanced digital state- of- the-art x-ray equipment providing the best image quality in the shortest amount of time, with very low dosage to our patients. We are able to capture images in seconds and obtain all our physicians protocols, including stitched images for scoliosis and hip-to-ankles. NOTE: For MRIs, MRI Arthrograms, CT w/o contrast, orders and authorizations must be received by Clinic prior to scheduling. Florida Orthopaedic Institute does not perform fluoroscopies for outside referrals.